Hey, and thank you for checking out my first guide for jungle Ymir. My name is Pellie and I primarily play conquest and main jungle. and show others why I like the ice-cube so much. I decided to make a guide on one of the best guardian jungles. Ymir is an easy god to learn, fun to play and is already given to you for free, there's no reason not to try this build! Note: Since this guide is for jungle and is conquest-oriented, this build will not be as effective if used in any other mode. Frostbite is a decent passive for Ymir. This passive and his great base damage on Glacial Strike is why he's one of the only viable guardian junglers. It gives him early camp clear, that most guardians don't have, thanks to the 100% damage increase on his next auto attack. Lategame, however, the damage won't be as useful because he wants to CC or zone enemy gods rather than deal damage. The damage reduction is nice but won't be that noticeable overall since he usually isn't focused by his enemies in the mid/late game because of his tankiness. Ice Wall can either be Ymir's greatest ally or enemy. There are so many ways to use this ability but it's also so easy to understand. It's a wall that can block enemy and ally attacks, stop enemies from chasing, and zone. Ice Wall can block abilities and auto attacks, so if there's an opposing Ah Puch that used Undead Surge you can easily wall it before it actually damages a member of your team. It works for most abilities that can't go through walls. There's three counters to Ice Wall, the relic Phantom (but the cooldown is 180s), Sol Disapparate and certain jumps/leaps. 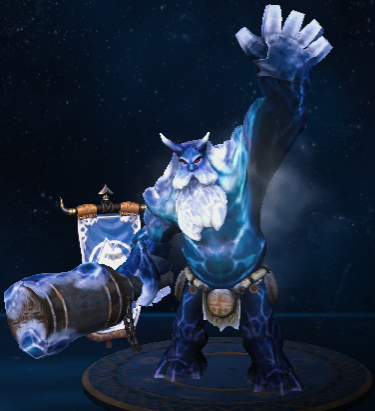 Though, if you're playing Ymir you must bait out any kind of escape with Glacial Strike or Frost Breath before you should even think about using Ice Wall because it will block you and your teammates off from the opponent if they leap over it. This is why you should use this ability carefully, you could accidentally harm a teammate by trapping them from the team or let an enemy survive. This ability is overall good, but it can be fantastic or awful depending on the use. Try and use it to stop enemies from entering teamfights or chasing allies or yourself. It's not as recommended to upgrade Ice Wall before his other abilities because the wall staying up for longer isn't really worth if you look at Ymir's other options. Make sure to max it last. Note: There's a very short delay after you cast Ice Wall and when it actually appears. Make sure you time it correctly. Glacial Strike is a great ability for Ymir and works with his other skills well. 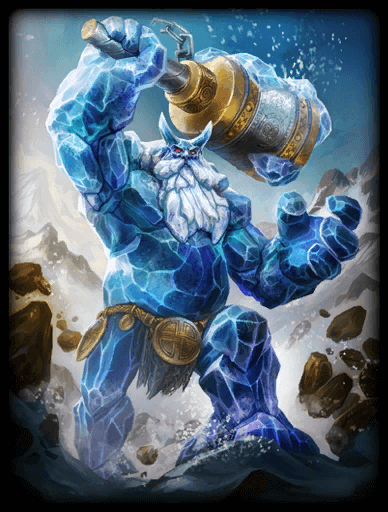 It has good base damage, great scaling, even though Ymir doesn't need much magical power, slows, applies Frostbite and actually has a pretty low cooldown for an ability belonging to a guardian. Early game, it is great for clearing jungle camps and since this is jungle Ymir, make sure to upgrade his second ability first. Glacial Strike is his main source of damage and Glacial Strike having no range is a huge weakness to a tank like Ymir where he has little to no mobility. This means that Ymir will struggle to reach a god that he can actually damage without them escaping. However, if he does close up to an enemy god, Glacial Strike is easy to hit even without set-up from any type of crowd control. Note: Like Ice Wall, there is a small delay. Try not to use Glacial Strike when the opponent is at the edge of the targeter, but when you can auto attack them. Frost Breath is what ties Ymir's kit together. It's a fantastic CC ability that can is really, really good setup for any damage-dealing god. It doesn't matter if you are a mage, hunter or an assassin; your main damage works well with Frost Breath. At max rank, the freeze lasts 2s. Two. Seconds. That's a long time. It's so easy to go from full health to respawning in two seconds; especially late game where everyone is grouped up and fully built. Two seconds is only at max rank though, so Ymir would like to prioritise Frost Breath after he maxes Glacial Strike, even if that means skipping points on his ultimate. Similarly to Glacial Strike, close range is a huge problem for this ability, but unlike Glacial Strike Frost Breath has a longer cooldown. The cooldown is 18s without cooldown reduction, so building CDR is important and make sure to use it on wisely. Try and use Frost Breath to stop an enemy for harassing your squishier allies, set up a kill on the opposing mid/hunter or force an enemy to back and then reengage. Note: Be aware of diminishing returns when using Frost Breath to CC chain. Diminishing returns are when a target is affected by any type of hard crowd control they are affected for the entire duration but if they are hit again with another type of hard crowd control the effect will only last for 66% of its original duration. Any other effect after the second will last for 33%. Shards of Ice is honestly the icing (pun intended) on the cake for Ymir, the slow isn't too great but it does a LOT of damage in a BIG area. The base damage fully-charged is similar to a mages' ultimate with the extra benefit of applying passive, zoning and also causing havoc in the middle of the teamfight with enemy gods trying to leave the radius of Shards of Ice as quickly as possible. The main issue with Ymir's ultimate is the fact that he has to remain in place when casting it. This isn't too much of a problem because of Ymir's natural bulk plus health/defensive items lets him survive attacks easily. However, he is not invincible so be careful on how and where you use it. Try to combo Shards of Ice with his other abilities, any will work decently but a Frost Breath and an Ice Wall behind them to block their escape is usually the best option. Despite the high damage potential, it isn't worth upgrading his ultimate over his second or third ability. The hard crowd control and better jungle clear and just overall damage are just much better options. Note: You can cancel out of Shards of Ice at any time, but it will do reduced damage. If you are guaranteed to die and you're already in your ultimate, cancel it early so you can at least deal damage and help out the team. This is a relatively simple combo, just place your wall in front or behind the enemy to prevent them from dodging and then use your Glacial Strike for damage then follow up with an auto attack enhanced Frostbite for extra damage. This is similar to the previous combo, but it's just easier to secure your Glacial Strike with this one. Again, just walk up to the enemy Frost Breath them before they leave and then use your Glacial Strike. Again, this is just a more complex combination of the two other combos. The Ice Wall prevents anyone from escaping Frost Breath and then hitting Glacial Strike to deal damage with a Frostbite basic attack weaved in afterwards. This combo makes it easy for Ymir to charge his ultimate easily thanks to the set up. Sneak behind them or use Blink to engage then Frost Breath them and then use Shards of Ice. This is the exact same as combo four, but the Ice Wall alows for people to get trapped in the Shards of Ice and struggle to escape. Shoes of Focus are what I normally use for Ymir. You could trade them out with Shoes of the Magi and it wouldn't really matter, but with the pen you get from Void Stone I find the extra cooldown reduction and mana more helpful so I can spam more skills. Breastplate of Valor is a great item in general. It provides mana, physical defence and cooldown reduction at a cheap price. Though, later in the game you might want to sell Breastplate of Valor and replace it with Mantle of Discord. Mantle is similiar to BoV but it gives less physical protections and cooldown reduction but gives a fantastic passive and magical protections. Since Mantle of Discord is a expensive item, it'd be recommended to to sell BoV and buy it when the rest of your build is finished. Void Stone allows Ymir to have early pen with a decent amount of magical protection and power. Since we're playing him jungle, he'll more often than not be in the mid lane and mostly ganking the duo lane. The magical protection will help against guardians in duo that are roaming and the mages in middle. The aura is also great for your mid-laner, considering you'll be with them for most of the early to mid game. These three items are the core of this build- always build them when using jungle Ymir. The rest of these items are completely situational. Remember, you should never ever use the same build in every single game. Winged Blade is so good on Ymir that it's almost core. Only reason it isn't is because in certain comps Winged Blade's passive is kinda useless if you are facing a team with little to no slows. Though, the passive isn't the only reason of why it's great. It has great stats having health, movement speed crowd control reduction and attack speed. Ymir loves all of these stats except for maybe attack speed and the passive is great for him being so immobile. You'll probably want to build this in most of your games. I love Spirit Robe a lot. Like, a lot. Though, it is a poor man's Mantle of Discord having weaker magical defence, physical defence and cooldown reduction but at a cheaper price with a different passive. Spirit Robe is fantastic against teams with annoying CC chains thanks to the great passive and the cooldown reduction. The downside is that it has no health and if you look at our core items, they also have no health. Defence with no health is just not worth it, so only build it if you have other items to make up for the lack of health and against a team with high crowd control. Situational early-mid item 3- Hide of Urchin. I mean it when I say Hide of the Urchin is one of the best items in the game. If your team manages to get kills at least. It offers magical defence, physical defence, health and mana! Plus, it stacks on assists or kills to get even more defence. You're probably wondering why it's not a core item and that's because of the whole stack thing, if you don't get stacks it's not going to be worth it. So, if you're behind the enemy team significantly there's no point in getting it. Though, if it is rather close or you're ahead, there's no downsides honestly. Just make sure to get it built quickly, around 2nd or 3rd item. Polynomicon is a good item for early damage on Ymir and works really well with Frosbite because both effects are very similar. It provides good early damage, lifesteal and mana for sustain. Buying Polynomicon means that you'll be less tanky in the early and mid game, where you are most vulnerable, but getting it late game won't be worth it because Ymir is not the one dealing significant damage late game. The damage also comes from your magical power and Ymir won't really have that much power in any stage of the game to make it a core item. I'd say to get it when you are ahead of the enemy jungler/mid. Dynasty Plate Helm is a great item that is in most mages builds right now. This is because it is very cheap and has great stats early game. The physical protection is useful against assassins in the jungle and the magical pen and power is a greay early game spike in damage. I wouldn't personally say it's core, but it's very helpful for clear and ganks. If you are going to get it, you should get it second or else it won't be worth as you'll sell it lategame no matter what. Anyone of the items I listed in the mid-late game section is fine; though I recommend selling it for Bulwark of Hope, Mantle of Discord or Midgardian Mail. These items are powerful during the early to middle stages of the game, so try to build them as early as possible. Situational mid-late item 1- Midgardian Mail. Midgardian Mail is not that great with Ymir as he likes the cooldown reduction from Breastpalte of valor more than the health from Midgardian Mail, and the same can be said for the mana from Hide of the Nemean Lion. Despite this, both are very powerful against auto attack centred gods such as Rama, Kali and Erlang Shen. So, try to only use it if the main threats on the opposing team are basic attack reliant. Be wary of Qin Sais though, it'll completely destroy the health from Midgardian Mail in no time. Like Midgardian Mail, Pestilence is for hurting team comps that have a good amount of heals and regain. This includes meditation, healers like Aphrodite, lifesteal and items similar to Mail of Renewal. This item is actually really useful against double lifesteal, thanks to the aura effect, or gods that have great sustain built into their kit. Against healers this item is a must, it overall has pretty good stats and the only other real magical defensive item that outshines it is Bulwark of Hope. Soul Reaver is great at dealing damage without actually needing magical power, though it does give 100 power and 300 mana as soon as you finish it, thanks to its passive. The passive is great for blink into Frost Breath into Soul Reaver shenanigans that allow you to pretty much 50% any squishy with a Frostbite basic attack. It's also effective against tanks due to the % damage and the cooldown isn't too long on it either. Yet, there's a reason why it isn't core; it isn't that reliable because all of your abilities procc it except for Ice Wall and you can accidentally use it when you just wanted to freeze from Frost Breath. Also, because Ymir really doesn't need to be dealing damage; he's there for the peel and setup. Get it if you're ahead or your team has low damage or magical damage. Hide of the Nemean Lion is a weird item on Ymir. It's primarily used on warriors in the solo lane while supports pick up Midgardian Mail. I don't recommend it unless you are facing an auto attack based team comp and the solo lane warrior picked up Witchblade, your support already picked up Midgardian Mail or that you'd rather have the physical protection over health. Mantle of Discord reminds me of the late-game version of hide of urchin, it's a fantastic item on pretty much anyone except the mid and adc, yet it takes a while for it to actually come online. In Mantle of Discord's case, it's really expensive. I recommend selling Breastplate of Valor or Spirit Robe, if you got it, for Mantle of Discord late game because of the cost. Though, if you're ahead it wouldn't be a bad idea to pick it up earlier. Bulwark of Hope is so good and probably the best item to provide magical protections in order to take on a mage. It's got health, a shield, magical protections and crowd control reduction. If there's two mages on the enemy team that aren't healers, you should get this item. Or, if the mid lane is just ahead and destroying your team; get this item. Seriously. I love it. These items are either expensive or more effective during the later parts of the game; so try and buy these items during that period. Wrath is a great relic for early clear and early objectives. Wrath allows Ymir to clear jungle camps quicker to allow for better and faster rotations, gives his team the secure to sneak a Gold Fury or Fire Giant without really needing to use Shards of Ice and can give him a short stun if he ever needs more crowd control. I love this relic and I recommend you get it for your first relic slot but, if you don't feel like you need wrath then I would say try sprint or Curse. Blink is Ymir's way initiate. Without it, it's really hard for Ymir to start fights when he starts getting poked out by damage dealers or getting CC chained. It makes up for his lack of mobility and allows him to setup kills for his carries easily.Blink is fantastic on Ymir and there's honestly no reason not to get it. Sprint is a great relic to pick up at the start of the game instead of Wrath. It can be used to chase, retreat or to counter curse. You can't really go wrong with sprint but one does the job fine, so I recommend getting sprint when your support would rather get something like shell or meditation. Like Sprint, Curse can be used to escape from enemies or to engage on enemies. It makes Ymir's ganks a lot stronger allowing him and his team to get ahead from early rotations. Curse also provides 40% healing reduction so it's a very good relic to pick up against healers like Ra and Sylvanus. However, it's easily countered by Winged Blade and sprint- two very popular items. Buy curse when you are against a team that relies on healing or a team that's easy to lockdown with no slow cleansing/immune abilities. Clear speed buff then do mana buff with your solo, if you have wrath you can choose what camp to use it on. Now go to solo lane and clear the first wave before leaving to contest the fire elemental with either your solo or mid; it depends on who got their faster. Now, rotate to mid and try and get the left and right mid harpies while helping your mid-laner clear the mid wave of minions in-between. Whenever there is no wave to clear in mid, either clear a camp with one of your teammates or try and gank a lane. Farming is very important for Ymir because without protections, he'll become a target for the early game. Ymir's clear is actually pretty good for a guardian and he should be able to clear most camps decently by his own without wrath. Though, this is not ideal as you should be splitting xp with another member or two from your team; most likely the support and mid. Ymir should be focusing on getting ahead of the opposing jungler, by taking their camps or by tanking the mid harpies/fire gremlins before him. Always try to be active in jungle, if there is no jungle camps or waves to split, try and gank a lane. When ganking lanes as Ymir, make sure any type of escape or relic is burnt before you want to fully commit. If an enemy hunter has beads, try to get the support or your own hunter to force them out or force it out yourself. If you gank an alone Freya and freeze her to bait out her beads, you can always gank later before the cooldown is over and then commit fully this time by killing her. Sometimes not getting a kill is fine, if you get an ultimate or relic when you didn't do anything but give up a little bit of farm that's completely worth because your teammates could now be able to get a kill thanks to you taking their relic. Even if you didn't get a kill, a relic or an ultimate, just relieving pressure for your teammates can be worth it too. Ganking as Ymir is difficult without blink, so try and come up behind them and Frost Breath and then Ice Wall to block their escapes while your team follows up with their abilities to hopefully get a kill or two. You could also zone them with Shards of Ice by charging the ultimate next to their escape, so they either have to suffer a huge loss in their health bar or go towards your teammates. Thanks to low mobility, it's easy for Ymir to get caught out of position in his own jungle even with a speed buff. Wards are already vital to conquest, but with Ymir he absolutely needs them in order to farm safely. Warding also allows you to see if enemies are planning to invade your jungle since he isn't the safest god to play which is also super important. Try and ward jungle camps and objectives such as: boars, fire gremlins, mid harpies, back harpies, buff camps and the gold fury. Summary for early game: Try to farm as much as possible and deny farm from your opposing jungle, but remember not to go too deep and always have teammates nearby when stealing enemy camps. This doesn't mean that ganking is wrong though, try and help your team out by ganking enemies that are too deep and out of position. Also, remember that his passive Frostbite is very useful early game and it combined with the high base damage of his Glacial Strike could get a few surprising firstbloods or early kills. In teamfights you should try to zone the enemy carries from harming your team or the frontliners from zoning your own carries. You ult is great for disrupting a fight as usually people panic when Ymir charges Shards of Ice and try to escape. Try to Frost Breath squishy targets for your team to follow up and remember to try and stay close to your team and not go too far from them. Towers and the gold fury are very important objectives, though you probably won't be able to take either of them without a won team fight; or cheesing it with split pushing or sneaking and burning the gold fury. Ymir can burst the glold fury easily with wrath and Shards of Ice, so don't be afraid to sneak one or two of them. Most of your time will be spent farming and denying your opponents farm to get a better gold and experience lead, however. Mid game is when everyone starts to rotate and group more often so you should be rotating with your teammates as a unit of two or more people at a time. Remember to split almost every camp with at least one teammate. The ward placements are basically the same for early game, just ward jungle buffs and the gold fury; your other team members should have the rest of the spots done already since the ward limit is two. Though, you should buy more often at this point in the game, like I said earlier, everyone is grouped and you should be cautious of a random three-man gank at your speed camp. Summary for mid game: Stay close to your team and try to deny your foes as much farm as possible. Use blink for ganks or to engage on someone who is out of position. Don't be afraid to sneak a gold fury due to Ymir's fantastic secure/burst. In teamfights, like in mid game, you'll want to peel frontliners off of your mid/adc or zone the opposing carries from the fight. To initiate a fight, blink in first and Frost Breath to allow your team to follow up. If your target is squishy and didn't beads, they're probably dead. Be careful of the rest of their team collapsing on you though, since it is late game and most players are fully built. The main objective late game is the fire giant. Everyone in the game are focusing on the fire giant side of the map and teamfights are usually happening around there. This is because the buff that fire giant gives lets you siege or win teamfights easily. A fire giant basically guarantees a couple towers or a phoenix. Ymir can burst/secure/ the fire giant easily with wrath or Shards of Ice. The ward spots for late game have changed completely and everyone is now prioritising the fire giant side of the map and wards that are pretty deep into both sides of the jungle. Make sure there's always a sentry directly on top of the fire giant spawn and multiple wards around that area. Both teams will always be close to the fire giant, unless they are clearing red buff/split pushing, late game so getting a free kill thanks to vision will drastically improve the chances of winning teamfights. Summary for late game: Just group up with your team around fire giant, try to catch a kill on an unsuspecting enemy and peel for your carries. Try not to get caught out because late game the damage dealers will probably have a lot of pen, like Obsidian Shard or Titan's Bane, and will be able to shred Ymir. What Gods are compatible with Ymir? Ymir works well with most of the gods in SMITE, so please remember that I'm only going to add what gods I personally think mesh well together, and most mids, rather than the entire cast. Note: Remember this is jungle Ymir, so I'm not going to list every single adc. Instead, I'll list every single Mage as jungles will spend most of their time near the mid portion of the map. Ra has gotten popular recently thanks to the SPL. In my opinion, he was underrated before TheBest started playing him, all he really needs is good setup from his team and a Searing Pain can rip through teams. Thankfully, Ymir has fantastic CC and setup for Ra. He can Frost Breath the enemy while Ra secures kills with Celestial Beam or Searing Pain. Ra however doesn't have a real escape, his passive is goo, especially with cooldown, but he doesn't have an actual dash or leap. This leads him to be easily focused but Ice Wall can prevent the mid laner from getting chased. Also, getting a heal from Solar Blessing while you're charging your Shards of Ice is nice too. I really like Isis. I really like Ymir. I really like Isis and Ymir on the same team. Seriously, these two have such great CC together and there's so many possible combos. Shards of Ice and Circle of Protection are practically made for eachother. Circle of Protection has healing and damage reduction allowing Ymir to be safe while he's charging Shards of Ice, that gives a slow making it harder to get out of both ultimates by the way, then boom. Massive damage. Also, don't forget that even without her ultimate Isis can stop targets from escaping Ymirs ult with her Spirit Ball stun. Speaking of which, getting frozen into a max range Spirit Ball followed by Glacial Strike and Wing Gust is insane. Isis also has great early game and clear which allows Ymir to be more aggressive early. This is probably my favorite combo for Ymir, but I wouldn't say it's the best. Janus is, in my opinion, the best midlaner at the moment. He has fantastic mobility, good damage and great utility. Frost Breath allows for easy Portals into Unstable Vortex combos which is insane damage mid-late game. Also, if you paid attention, you probably notice how I keep saying about Ymir's biggest weakness being mobility and lack of initiation without Blink. You know who has fantastic mobility? Janus. Three of his abilities allow Ymir to be more mobile and two allow for fantastic ganks onto the duo or solo lane early game. I highly recommend these two together. The main reason why Nox isn't as good as the other top mids is because her damage is risky. If you miss your Shadow Lock or Siphon Darkness then you can't really do any damage without wasting your ultimate or escape. She needs CC to help her hit her main combo. Ymir has fantastic CC. Frost Breath into Siphon Darkness and Shadow Lock is basically a kill. Night Terror also works well with Ymir because it stops at walls and causes AoE damage, if you use Ice Wall correctly this could cause a lot of damage to multiple enemies. Just try not to mess it up and save the enemy instead. Unfortunately, Nox has bad clear early game so you'll have to play a little more passively VS an early game jungle or mid. Kukulkan is very similar to Ra and Nox; they need setup. Again, just Frost Breath into a Whirlwind, Zephyr or Spirit of the Nine Winds. Zephyr is great for slowing them down while you charge Shards of Ice and Ice Wall to keep them inside a Whirlwind is annoying. Kukulkan is also immobile and he's already going to be focused down, so try and Ice Wall to create a barrier from your mid and the enemy. They work fine together but there's better mid lanes for Ymir. This is mostly because Kukulkan isn't that great in conquest right now. Scylla honestly just does everything Kukulkan does but better. Her only negatives are early clear and the fact she can't use Spear of the Magus as well as he can. Just Frost Breath while Scylla uses I'm a Monster or Crush and you should be fine. She has awful clear though, so try and help out mid often. Vulcan is popular right now, so you'll see him often. He's pretty good with Ymir, max range Earthshaker while Ymir blinks in and freezes or walls them off is around 80% of the enemy's health gone. If enemies escape Ymir's Shards of Ice Vulcan can just Magma Bomb and knock 'em right back in. Also, of course the Frost Breath into [enter damaging mage ability here] works in this scenario as well. Vulcan also has good clear early too and pretty aggressive in lane which works well with Ymir. First off, let me make it clear that Anubis is not a good god in any competitive setting whatsoever. But, this is casuals so..
Ymir is great for Anubis. You have to remember, every single one of Anubis's abilities are tick damage so any slow or other CC matters. Every second of CC counts for Anubis. Which is nice because Ymir has a ton of CC, so any of his crowd control abilities work well here but the main combo should look like: Frost Breath, Grasping Hands, Glacial Strike, Mummify and then either Plague of Locusts or Death Gaze. Honestly, this could go in any order as long as it begins with a crowd control ability. The slow from Shards of Ice stacks with the slow from Grasping Hands which is super annoying, Death Gaze into Ice Wall to prevent them from escaping the range is annoying and Frost Breath into any ability of Anubis is annoying. This duo is just annoying. Pretty much every other combo can be summed up as: Frost Breath into mages entire kit. Dead enemy. So, I think I'm done with the mages for this update. Erlang Shen is a fantastic god, he can work in solo, support or the jungle amazingly. So, naturally, he works well with any god and every team composition. He has fantastic CC and Qin sais on him is no joke. But, Ymir in particular makes it easy for Erlang Shen to chase enemies and then qin sais them to death because of Ice Wall and Frost Breath. Also, five man 9 Turns Blessing into Frost Breath and Shards of Ice is hype. Vamana is a great solo laner and a fantastic god, so you'll probably see him often. This isn't too bad because he works with Ymir decently. They can chase enemies for years. Like, actual years because of frostbound and then you got the Ice Wall to prevent dashes. It's almost as annoying as the Anubis and Ymir wombo combo. Vamana can slow and knock up targets in Shards of Ice so Ymir can charge it easier which is nice. Colossal Fury allows Vamana to become a giant, unkillable Erlang Shen but with AoE damage and slows. So, if you add an Ice Wall into the mix it#s hell for your foes. Odin isn't that great in solo, support or jungle; but if he is played he's pretty good when paired with Ymir. Ring of Spears and Shards of Ice guarantees the full damage which can destroy squishies. Frost Breath into Odin's Raven Shout and Lunge combo can delete health bars early game. Speaking of early game, Odin is fantastic in the early game and this is great for Ymir as it allows him to be a lot more aggressive with Odin. Amterasu is easily one of the top solo laners at the moment, her laning phase is not great but her late game and teamfight is phenomenal. Ymir also has pretty good teamfight, so they work well together in the late game. Divine Presence is very helpful for Ymir's lack of mobility and Ice Wall is excellent for preventing escapes from Dazzling Offensive. Dazzling Offensive is also fantastic for setting up Shards of Ice. It's hard to find certain pair ups for Ymir when they are warriors, because they work with anyone well. Warriors are mostly picked to counter the other solo laner, not to work well with their jungler. Hou Yi was a decent hunter, but recently he just received a significant buff so he's even better than before. Hou Yi's Ricochet can be used on an Ice Wall to make some flashy plays. Sunbreaker and Shards of Ice both slow and do serious damage so they'll constantly be stuck while their health drops quickly. Hou Yi and Ymir are great in the duo lane and they're pretty good together when the team starts roaming together. Artemis is kinda awful but I see her often and she actually works well with Ymir so I'm adding her. Artemis and Ymir can actually set up eachother well and both of their crowd control abilities work together beautifully. Artemis can stun targets with Calydonian Boar in Ymir's Shards of Ice while Ymir can freeze targets while Artemis crits them to death. Medusa is an early game hunter with high ability damage and Ymir allows for her to easily hit those abilities. Both are fairy aggressive early so they are compatible in that stage of the game. Frost Breath is excellent when used with Petrify and to confirm the stun. Remember, Petrify is a terrifying ability so being forced to look at Medusa's gaze is a free beads or a death. Anhur, like Medusa is primarily early game focused, so he's also great with Ymir. Ice Wall and Impale are fantastic together and will deliver immense damage in the early and mid game. Shifting Sands and all of Ymir's slows stack and can allow Anhur to clean up with a Desert Fury. Ne Zha can one shot carries late game with his Wind Fire Wheels. The problem is that it's difficult to hit Armillary Sash and if you do manage to hit it it's highly likely that the enemy will pop purification and waste the ultimate. Ymir allows for Ne Zha to hit the Wind Fire Wheels with little to no trouble. Thor and Ymir are incredibly annoying together because of Ice Wall and Tectonic Rift together are great zoning tools. Both of these Gods are fantastic are setup and can setup each other and their other teammates effectively. Anvil of Dawn is great at setting up Shards of Ice while Frost Breath can set up Berserker Barrage or Mjolnir's Attunement easily. Thanatos is a very hit or miss assassin. His Death Scythe deals a lot of damage but it's difficult to hit. Ymir makes this irrelevant with his Frost Breath and allows for Thanatos to do a lot of damage in the early game. Thanatos can stun enemies into Ymir's Shards of Ice with his own ultimate, Hovering Death. Awilix is a god who, while she has a knock up in the form of her Moonlight Charge, needs knocks up and set up for Gravity Surge. While Ymir doesn't have a knock up in his kit, he can use Frost Breath to allow Awilix to get the knock up. You can add more damage to this combo by adding Shards of Ice to the end of it, so as soon as the enemy God gets pulled back into Awilix they get blown up by Ymir's ultimate. Athena is superb on any team, but she provides fantastic global presences and initiation which is great for Ymir specifically. Defender of Olympus can defend Ymir while he's charging Shards of Ice and then Athena can set up the Frost Breath and Glacial Strike combo with a Preemptive Strike into a Confound. Like Thor, Crabrakan is irritating when paired with Ymir because of the wall wombo combo of Tectonic Shift and Ice Wall. The walls are actually very deadly when use in conjunction with another, because Cabrakan and Ymir can combo their Shards of Ice and Tremors which can trap people forever while dealing huge damage. Terra is already a top support and she's phenomenal with Ymir in the jungle role. The root from Monolith can perfectly set up Shards of Ice while she CC chains anyone trying the leave the area. Terra has great global presence with Terra's Blessing and helps anyone on her team; including Ymir. The extra movement speed from it is also super helpful. Geb is a defensive and supportive guardian, like Khepri, which is the opposite of Gods such as Ymir or Ares. Geb also needs to use Blink to initiate, but the Cataclysm is great setup for Shards of Ice. Geb's Stone Shield can help Ymir get out of some bad situations or CC chains. If you're going to be playing Ymir, you need to know what gods, relics and items counter him or threaten him in any way. So, in order to help solve these weaknesses, I listed some of them in this section. Note: Please understand that I'm not going to list every single magical defensive item, every pen item or anything like that. Again, it's just going to be some of the counters. Ymir needs to get close in order to use any of his damaging abilities and Isis's kit is entirely close ranged and full of CC that makes it impossible for Ymir to even attempt to Frost Breath her. You'll have to engage with Blink and freeze with Frost Breath instantly. Geb can just Stone Shield to clense the freeze or just use Shock Wave to prevent Ymir from getting close and harming Geb's allies. You'll have to force out the Stone Shield before going all out or just catch a squishy target not within Geb's reach. Sol's third ability Disapparate makes it impossible for Ymir to chase because when she actives it she can pass through Ice Wall and can't get crowd controlled or damaged by any of his abilities. This is mostly for the early game, but late game Odin is a great ult bot because of Ring of Spears phenomenal teamfight potential. Ymir can't leave Ring of Spears without phantom, yet it's still on a longer cooldown than Odin's ult, allowing him to get bursted quickly by Odin's team. Ares can easily poke out or potentially kill Ymir in the early game thanks to his Shackles ability. While Ymir is obviously not affected by the cripple, the slow hurts him a lot and Ares' damage is just insane if he manages to hit all three chains. Ares can also force out Shards of Ice, unless youpurification, with a No Escape leaving Ymir with no real AoE damage. Nemesis Divine Judgement completely ruins Ymir. The slow is awful for him without Winged Blade or sprint, the protections steal is awful and taking away a percentage of his max HP is awful. This allows Ymir to get bursted down by the carries easily while he can't do much about it. Though, Retribution is weak to CC so Ymir has that going for him. Purification completely nullifies Frost Breath potentially ruining his combos. If you see a Purification, try and bait it out before actually ulting or diving deep for the kill and then go in after it's used. Sprint makes it difficult to engage for Ymir because of his close-ranged kit, so it's obvious to why it will counter Ymir. It also makes it easier for Ymir to get chased down and killed because of lack of escape and mobility. To counter it just get your own sprint or wait out the duration. Curse makes Ymir move as quickly as an actual block of ice. So like, no mobility whatsoever. He's a sitting duck when this is used on him and makes him super vulnerable, but a Winged Blade or sprint should patch that up easi;y. Shell makes Shards of Ice do little to no damage and that's pretty much it honestly. He doesn't have any AoE damage except for the ultimate, but I think it's worth mentioning. If Mantle of Discord proccs on Frost Breath, that's a free purification out of a two second freeze. It's also a really good item that offers magical protections, so that's even more annoying for Ymir. Spirit Robe is a mini Mantle of Discord with a similar but unique passive. Instead of giving a free purification, it allows you to take reduced damage if you are constantly crowd controlled. I'm sure you understand why this is annoying for Ymir. You can put any pen item here, but Obsidian Shard and Titan's Bane are the best pen items against any tank with a large amount of protections. Both completely shred Ymir before he can even get close, so be aware of enemies with these items. How viable is Jungle Ymir? Ymir was always a pretty good jungle pick and now thanks to the new tank meta; he's a lot more viable. Ymir is a decent support, it's just that he doesn't have the healing of terra], the laning phase of [[sylvanus or the damage of Fafnir. Ymir is outclassed as a support but he's a better jungler than all of the gods I listed. Overall, Ymir is just slightly above average and that's only because of the meta we're currently in but that doesn't mean he isn't fun to play. Ymir actually is a pretty good jungler but how does he compete with the rest of his class? He gets outclassed by Athena, she's easily one of the top junglers out of any god. Athena just has much more mobility, global presence and some would argue that a taunt is a better form of crowd control than a freeze. Another great guardian is Cabraken.Cabraken is actually very similar to Ymir when played in jungle. Cabraken has more damage than Ymir, but is squishier with bad jungle clear and mana issues. I'd say that Ymir is slightly better than cabraken but it mostly depends on preference and team comp. Bacchus and Xing tien aren't very good in jungle, Bacchus is a fantastic support and Xing tien is a great solo laner so I don't see why you shouldn't put them there. Though, since we're talking about the jungle role, their main problems is that they cannot clear well without wrath, have awful mid harpy fights and mana problems. They do make up for it in their great team fight disruption and crowd control late game. 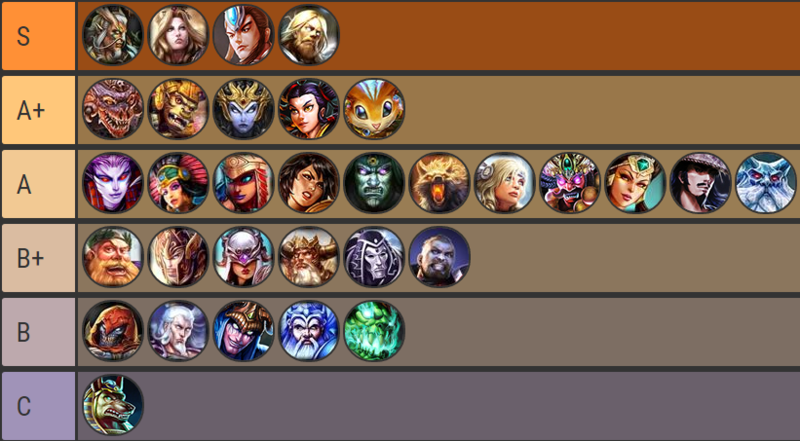 Since there is many junglers, I'd rather just show you a tierlist I made than explain why each one is high/low or better/worse than Ymir. I added the gods that were the most popular in the jungle role so if I missed any feel free to leave a comment and I'll add them in the next update. Overall, Ymir is a solid guardian that can play jungle, solo and support very well. He can even go damage or bruiser and make it work. Of course, this was just a jungle Guide but maybe in the future I'll add solo and support guides if there's actually a request for them. Like I said in the beginning, this is my first guide to a SMITE god so if there's any mistakes I made, English is not my first language so there is probably plenty of grammatical errors, or any type of feedback, feel free to tell me in the comments so I can update it! Thank you for reading this guide and I hope you enjoyed it because I certainly enjoyed making it. Commenting a bit more now that the contest is over. In your skills section, a bit of explanation as to why you level one skill over others would be good to add. I mean, it's pretty obvious for regulars, but for people not used to Ymir, it might help them understand. Also, separating large blocks of text into a couple of smaller paragraphs might be nicer on the eyes for reading. Anyway, great job on your guide, and would love to see more from you. 113391 Branmuffin17 Hey Pellie, Commenting a bit more now that the contest is over. With BoV as your 2nd item, how important is [[Shoes of Focus]] first? I'm thinking that for Jungle, the early aggression and pen from [[Shoes of the Magi]] might be more core than Focus. I know you mention in the items section below that you can switch between the two, but I'm feeling that Magi might be the better choice? The long CD on [[Frost Breath]] means that it's unlikely that you'll use it more than once in a fight, and conversely, [[Glacial Strike]] has a low CD and you don't need more than 20% early for camp clear and other things... In your skills section, a bit of explanation as to why you level one skill over others would be good to add. I mean, it's pretty obvious for regulars, but for people not used to [[Ymir]], it might help them understand. Also, separating large blocks of text into a couple of smaller paragraphs might be nicer on the eyes for reading. Anyway, great job on your guide, and would love to see more from you. First off, great guide. It's well written, detailed, and useful for beginners. I do think that wrath should be placed in the situational section though. While hog can be useful against high pressure solo-jungle combos like Thor Ravana, the issue with hog is that it takes up a relic spot that purification or a teamfight relic that meditation or shell could occupy. Cherryo from Sanguine actually elects to go purification himself to combat the usually high cc the enemy team has. On top of that, hog isn't really vital for clear either. Ymir's Glacial Strike already does 90 damage at level one, with his autos dealing a lot of damage to camps with Frostbite. So Ymir's clear is already good. Wrath is just meant to relieve pressure from potential invades by speeding up clear. 112571 MagentaLatern First off, great guide. It's well written, detailed, and useful for beginners. I do think that [[wrath]] should be placed in the situational section though. While hog can be useful against high pressure solo-jungle combos like [[thor]] [[ravana]], the issue with hog is that it takes up a relic spot that [[purification]] or a teamfight relic that [[meditation]] or [[shell]] could occupy. Cherryo from Sanguine actually elects to go [[purification]] himself to combat the usually high cc the enemy team has. On top of that, hog isn't really vital for clear either. Ymir's [[glacial strike]] already does 90 damage at level one, with his autos dealing a lot of damage to camps with [[frostbite]]. So [[ymir]]'s clear is already good. [[Wrath]] is just meant to relieve pressure from potential invades by speeding up clear. Fixed a mistake in the Frostbite section; it applies to multiple targets. Added Polynomicon to the item selection. Fixed some inconsistencies with the formant. Added new chapter on how viable Ymir actually is in jungle. Added Dynasty Plate Helm to the item selection. The Frostbite section still needs that other correction on "damage increase on his next attack." It's a 4 second duration. Nice additions by the way, and thanks for explaining your opinion on his viability. FYI, I've added reference to your guide on the Conquest guide. 112567 Branmuffin17 The [[Frostbite]] section still needs that other correction on "damage increase on his next attack." It's a 4 second duration. Nice additions by the way, and thanks for explaining your opinion on his viability. FYI, I've added reference to your guide on the Conquest guide. I know, it was said before already, but your guide is really well done- it looks very neat (aspecially as for the first one) and shows that the person making it was willing to spend time on some research regarding formatting issues as well as establishing a certain style. I was just thinking; as your items' and abilities' descriptions are detailed and contain lots of helpful information- is putting the abilities in the spoiler even necessary? I'd say that the abilities' explanations could be debatably considered even more important than the items' ones, and thus should be seen by default. Also, talking about items- what would you think about adding a Polynomicon to the situational choices? Even though it does require a considerable amount of power in the build to be maximally effective, there surely are games when Ymir happens to get fed and can afford building mostly damage. Can't tell whether you know this but seeing that you answered to Bran yet the small mistake in "Frostbite only proccs on one single target" is still there, I just thought I could inform/remind you of the fact that when you want for your changes to be seen by everyone you have to "publish" your guide again; it won't make a new copy as one could fear but will just actually update it. And hey, overall it was really pleasant to read; with a kind touch of Ymir "Bye!" at the end- easy upvote, keep it up! 112524 Daelinn I know, it was said before already, but your guide is really well done- it looks very neat (aspecially as for the first one) and shows that the person making it was willing to spend time on some research regarding formatting issues as well as establishing a certain style. I was just thinking; as your items' and abilities' descriptions are detailed and contain lots of helpful information- is putting the abilities in the spoiler even necessary? I'd say that the abilities' explanations could be debatably considered even more important than the items' ones, and thus should be seen by default. Also, talking about items- what would you think about adding a [[Polynomicon]] to the situational choices? Even though it does require a considerable amount of power in the build to be maximally effective, there surely are games when [[Ymir]] happens to get fed and can afford building mostly damage. Can't tell whether you know this but seeing that you answered to Bran yet the small mistake in "Frostbite only proccs on one single target" is still there, I just thought I could inform/remind you of the fact that when you want for your changes to be seen by everyone you have to "publish" your guide again; it won't make a new copy as one could fear but will just actually update it. And hey, overall it was really pleasant to read; with a kind touch of [[Ymir]] "Bye!" at the end- easy upvote, keep it up! I added Polynomicon to the situational items. I didn't add it prior because I personally don't like it unless you're mostly damage; but it is a popular item so thank you for the suggestion. For the skills, I like them better hidden under spoilers because I'm assuming people are here for the build instead of how to use his skills and what situations to use them in. And, if they want more information they can just unhide them. I can get rid of them if that would help though. I also just fixed the Frostbite error. Welcome to SF! Wow, great job so far on your first guide! It's got a lot of information on abilities, item choices, and gameplay. I haven't read through it all yet (will do so tonight, I think), but I do have a couple of comments. Skill leveling: I understand and generally agree. I do want to point out that you can level your ult at 17 instead of 18, and wonder why you choose to level Ice Wall at 17 instead. Just 1 more second...difference between 4 and 5 seconds, at that point, seems less important than another level in your ult. Pros/Cons formatting: your Cons section starts higher than the Pros. Easy way to fix that is at the start of Cons, hit enter one or two times, and see again how it lines up. Or, perhaps you pressed enter one or two too many times at the end, since Cons is a shorter list? Either way, just pointing it out. Unless I'm mistaken, Frostbite is applied to ANY enemy (minion or god) that is hit by a damaging ability...you state it's only a single target. ALSO, you state it applies on his next basic attack. It's not a single effect like Hydra's Lament's passive...it has a duration of 4 seconds, and so can easily apply for multiple basics. In any case, will go over the rest of this guide later. Hope this is helpful! 112482 Branmuffin17 Hi Pellie, Welcome to SF! Wow, great job so far on your first guide! It's got a lot of information on abilities, item choices, and gameplay. I haven't read through it all yet (will do so tonight, I think), but I do have a couple of comments. [list][*]Skill leveling: I understand and generally agree. I do want to point out that you can level your ult at 17 instead of 18, and wonder why you choose to level [[Ice Wall]] at 17 instead. Just 1 more second...difference between 4 and 5 seconds, at that point, seems less important than another level in your ult. [*]Pros/Cons formatting: your Cons section starts higher than the Pros. Easy way to fix that is at the start of Cons, hit enter one or two times, and see again how it lines up. Or, perhaps you pressed enter one or two too many times at the end, since Cons is a shorter list? Either way, just pointing it out. [*]Unless I'm mistaken, [[Frostbite]] is applied to ANY enemy (minion or god) that is hit by a damaging ability...you state it's only a single target. ALSO, you state it applies on his next basic attack. It's not a single effect like [[Hydra's Lament]]'s passive...it has a duration of 4 seconds, and so can easily apply for multiple basics. [/list] In any case, will go over the rest of this guide later. Hope this is helpful! Thank you for the reply and all your points are absolutely correct. I'm new to this kind of stuff so it's really nice for you to give helpful advice; I'll make sure to fix it now. 112484 Pellie Thank you for the reply and all your points are absolutely correct. I'm new to this kind of stuff so it's really nice for you to give helpful advice; I'll make sure to fix it now. Finished reading, and will say that you explain things well, and we get an understanding of why you choose items, when you do, etc. Side note: on the Pros/Cons, you now have a bunch of head space. Also don't forget to fix the info in the Frostbite section. This next comment isn't anything really to do with the guide quality, just curious. I know picking up BoV alleviates your early mana issues, but wonder if you've tried the Dynasty Plate Helm + Void Stone combo for good, cheap power and pen (and maybe just get a couple mana potions for the mana issue). Thinking the CDR is more important for teamfights later in the match, so other than Shoes of Focus, you might be able to get away without it for a bit. Also, and this is a question not just for you but other experienced players as well...how viable IS Ymir as Jungler? I don't know why, but I never listed him in the Conquest guide. Thinking I should probably add him in the list...? 112487 Branmuffin17 Finished reading, and will say that you explain things well, and we get an understanding of why you choose items, when you do, etc. Side note: on the Pros/Cons, you now have a bunch of head space. Also don't forget to fix the info in the [[Frostbite]] section. This next comment isn't anything really to do with the guide quality, just curious. I know picking up BoV alleviates your early mana issues, but wonder if you've tried the [[Dynasty Plate Helm]] + [[Void Stone]] combo for good, cheap power and pen (and maybe just get a couple mana potions for the mana issue). Thinking the CDR is more important for teamfights later in the match, so other than [[Shoes of Focus]], you might be able to get away without it for a bit. Also, and this is a question not just for you but other experienced players as well...how viable IS [[Ymir]] as Jungler? I don't know why, but I never listed him in the Conquest guide. Thinking I should probably add him in the list...? I think you just need to get rid of some spaces somewhere...either at the top of pros, or the top of cons, or both, but not sure...I'd need to see the true code. I'd just suggest editing and viewing to experiment. 112568 Branmuffin17 I think you just need to get rid of some spaces somewhere...either at the top of pros, or the top of cons, or both, but not sure...I'd need to see the true code. I'd just suggest editing and viewing to experiment. I haven't actually tried Dynasty plate too often on Ymir. It probably is a really good pick and I just forgot about it. I'll try it today and see if it's worth as a core item later today. Also, added new section to show how viable Ymir is based on your question. He's just above average but he gets outclassed by Athena pretty hard. 112564 Pellie I haven't actually tried [[Dynasty plate]] too often on [[Ymir]]. It probably is a really good pick and I just forgot about it. I'll try it today and see if it's worth as a core item later today. Also, added new section to show how viable [[Ymir]] is based on your question. He's just above average but he gets outclassed by [[Athena]] pretty hard. I wouldn't really know since I've never tried it myself, but it seems to work for a lot of people. 112502 Technotoad64 [quote=Branmuffin17] Also, and this is a question not just for you but other experienced players as well...how viable IS [[Ymir]] as Jungler? I don't know why, but I never listed him in the Conquest guide. Thinking I should probably add him in the list...? [/quote] I wouldn't really know since I've never tried it myself, but it seems to work for a lot of people.